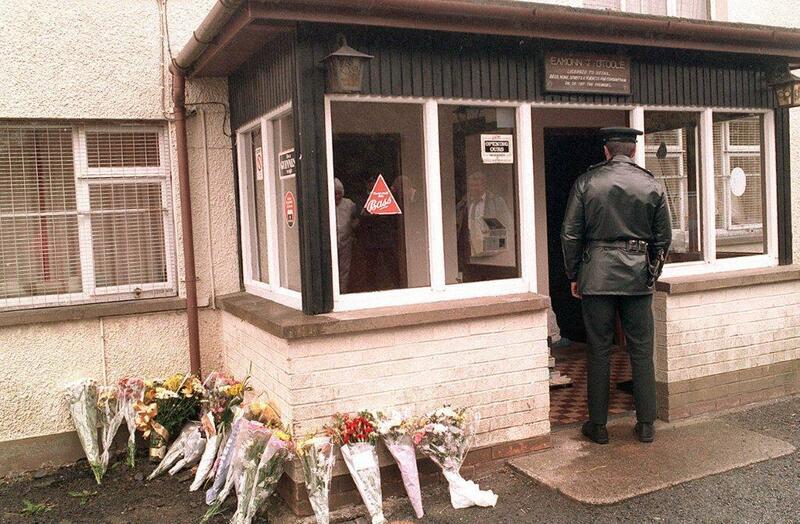 The families of the Loughinisland massacre today welcomed the announcement that Police Ombudsman Michael Maguire is to dramatically scrap his predecessor Al Hutchinson’s investigation into the 1994 UVF massacre of six men in Loughinisland and order a new inquiry into the killings. Lawyers for Mr Maguire, who took up office as Police Ombudsman in July, this morning (Thursday) told a Belfast High Court that he intends to overturn his predecessor’s controversial report, which had been branded a whitewash by the victims’ families when it was published in 2011. Emma Rogan (above), who’s father Adrian was one of those murdered in the atrocity, welcomed the decision to launch a new inquiry. Speaking outside the court, she said: “As families today we feel vindicated. “Al Hutchinson’s report is now in the bin. It is a good opportunity for Mr Maguire to put the record straight and hopefully he’ll do it in a speedy manner and we will get justice sooner rather than later. Maybe we’ll get a bit of justice somewhere along the line. Ms Rogan said that Mr Maguire’s decision to open a new investigation sent out a positive message that he was prepared to listen to the concerns of families. After taking office in July Mr Maguire ordered a review of the Hutchinson report into Loughinisland, following major public criticism from the dead men’s families, which led to Mr Hutchinson, a former Canadian Mountie leaving office earlier this year. The ombudsman’s decision to re-open the case is understood to relate to statements made by a self-confessed UVF informer identified as Person B and a former RUC detective, identified as Police Officer 04. Person B admitted having been in possession of the killer’s getaway car prior to the attack but claimed it had been sold on before the atrocity. On the day after the attack he was contacted by a detective and asked to go to Tennant Street police station in west Belfast so that he could give a statement about his links to the vehicle. A note was later found on Person B’s statement which instructed that he was only to be contacted through Police Officer 4. “The review has concluded that there are contradictions in the accounts given by Person B and Police Officer 4 to the earlier investigation which were not adequately pursued and require additional investigation action. In September 20011 Mr Hutchinson was criticised in a report by the Criminal Justice Inspectorate – at that stage headed up by Mr Maguire – which recommended that the ombudsman’s office should be suspended from investigating historic murders because of a “lowering of independence” in the office. CJI inspectors uncovered major “inconsistencies” in ombudsman investigations of the Loughinisland, McGurk’s and Claudy atrocities. The CJI report found that the previous ombudsman reports had been altered or rewritten to exclude criticism of police. Senior ombudsman officials had demanded to be disassociated from investigation reports, particularly Loughinisland, after their original findings were dramatically altered without reason. Ombudsman investigators believed that key intelligence had been deliberately withheld from them.